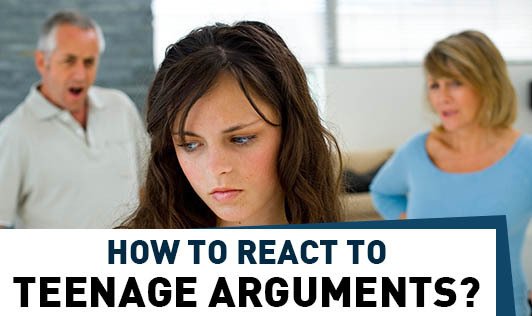 How to React To Teenage Arguments? It's not easy, but try to keep calm during arguments with your teen. Otherwise you can end up saying things that both of you will regret. 1.Accept that your teen will argue, and will make hurtful comments. Most of the time they don't mean them, it's just a reaction. 2.When the arguments become more serious and deep, which can happen out of the blue, you still need to stay calm, and, if possible, calm your teen down, too. 3.Try to defuse the situation. Don't make inflammatory remarks. 4.Be as conciliatory as possible, with empathetic remarks such as "I see what you mean on that" or "I understand how you feel". 5.Encourage them to talk, rather than shout. 6.It won't always work, especially if they have a lot of anger inside, and some teens are powder kegs of anger and frustration. In those instances, you can try walking away as a method of lessening the tension. 7.Say something like "You seem very angry, do you think it would be better if we talked later?" Ultimately, though, you can't ignore the situation. If your teen is that worked up, you need to do something about it. Bear in mind that often your teen doesn't have the emotional and developmental maturity to deal with anger, and letting it out is all they can do. There are techniques that can be taught that can help with cope with the problems. If extreme anger is a regular occurrence, then you should sit and talk to your teen and counsel them. Seek help from others parents, doctors or a psychologist to make the teen grow up to be a stable adult.